Marjan Park’s donkeys are descendants of animals that once called the Split Zoo home. The zoo closed a few years ago, and many of the animals were resettled. Today, 8 donkeys, 15 sheep, one goat, and two Shetland ponies still live there. Five employees help care for the animals. 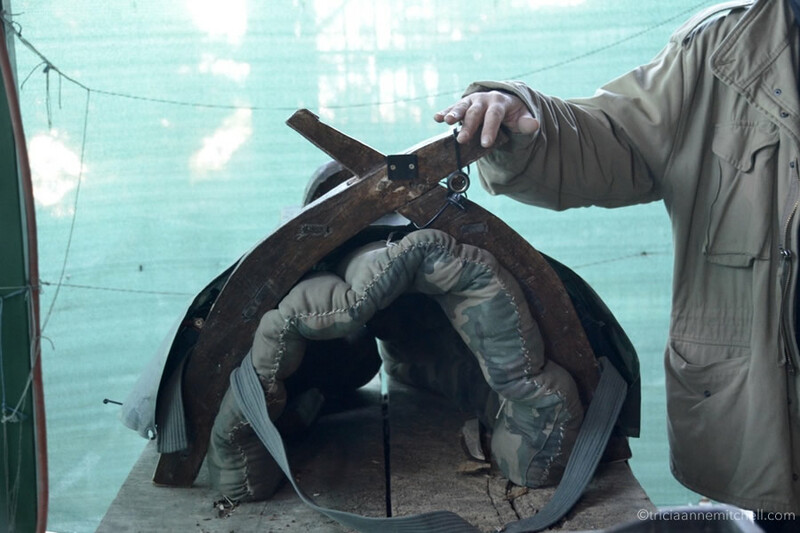 Split resident and artist Hrvoje Cokarić is trying to find an innovative way to help the remaining animals still calling Split’s former zoo home. He has spearheaded a project called Toward Europe Split. 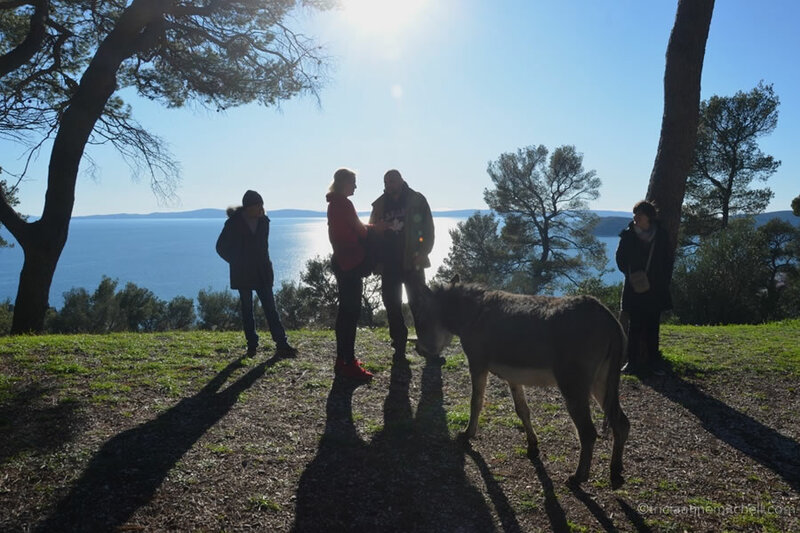 The project’s aim is to ensure that Dalmatian donkeys are recognized as an important symbol of cultural heritage even though their role has changed in the 21st century. Toward Europe has created a week-long artist’s residency program. Participants from Croatia and abroad have taken part, creating projects that incorporate the donkeys in some way. A local art gallery even offers free lodging to artists participating in the venture. 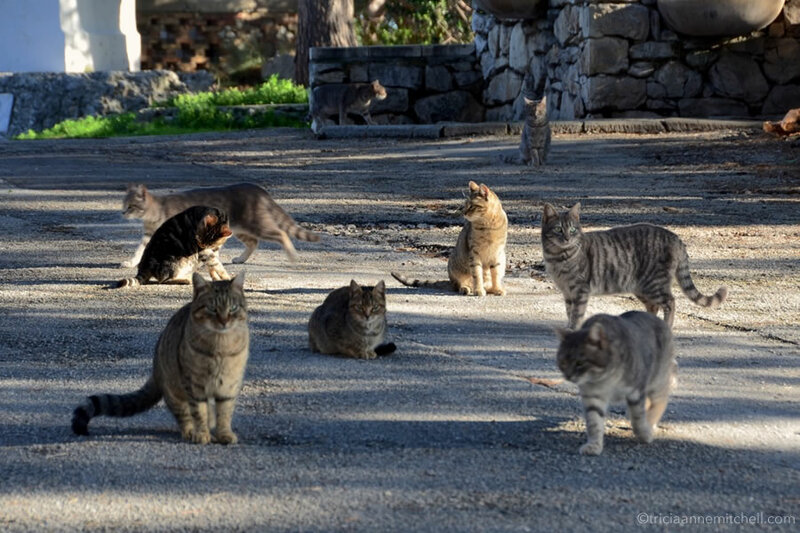 The city of Split helps with vet expenses and basic food costs, with some funding from Croatia’s Ministry of Culture. Hrvoje envisions the participating artists making short videos, classical paintings, even performances with the donkeys. Currently, Hrvoje and several others are making a documentary about the donkeys. More than ten artists have participated in the residential program so far, with each program generally lasting seven to ten days. The Toward Europe team is also in the process of retrofitting saddles to hold solar panels that will harness renewable energy. Artists can then take the animals out into the park, and have a means to charge their telephones, cameras, and other electronic devices used to fulfill their artistic vision. As for the former zoo space itself, Hrvoje and other community partners envision transforming it into a less-institutional landscape where the animals can wander more freely and visitors can learn about what life was once like in Croatia. They’d like to create an educational center. The fledgling educational program is already a hit with community members. So far it’s involved high schoolers, young people from a youth correctional facility, and people with special needs. 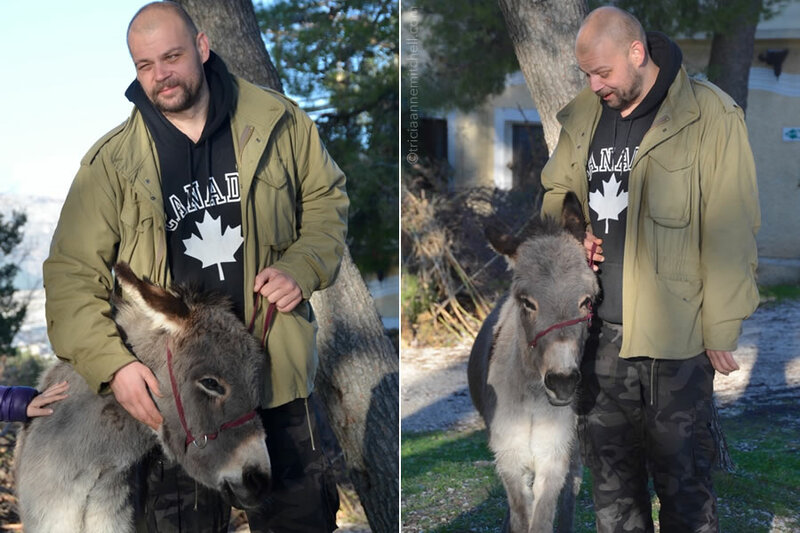 Since Hrvoje’s donkey expert forefathers died before he could glean information from them, he has had to learn about donkey behavior and care independently. One of Toward Europe’s projects is to document how to raise donkeys. 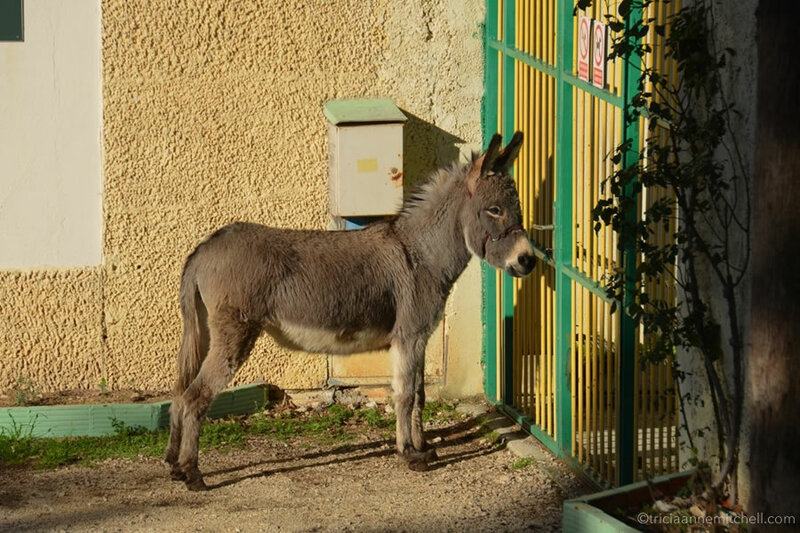 “Perhaps only 30 people in Croatia have knowledge of donkey [rearing],” he said. “We’d like to profile older people and their donkeys and share the profiles on YouTube,” he added. 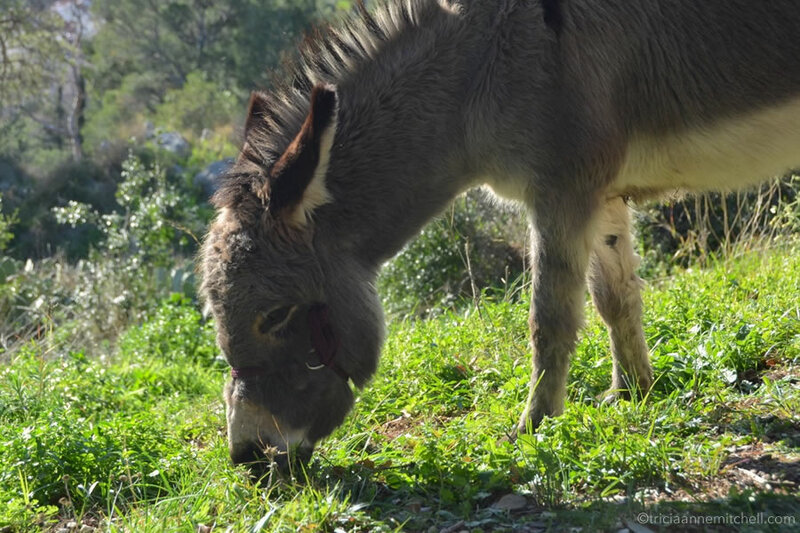 Marina and her donkey mates are a North African species of donkeys, hardy animals that would’ve once carried more than their own weight — perhaps upwards of 200 kg (440 pounds). But if Hrvoje has his way, Marjan’s donkeys won’t carry more than 40 kg (88 pounds). “They carried enough in history — let’s make a better future for them,” he said. Donkey Marina grazes in Marjan Forest Park. She’s named after a famous actress, Marina Abramović. Hrvoje says Marina is almost 4 years old. A young girl pets Marina the donkey, with Toward Europe founder Hrvoje Cokarić overseeing the interaction. Marjan is a popular spot for Split’s walkers and joggers as well as tourists seeking extraordinary views. Split’s sun-drenched promenade, as seen from Marjan Park. Ferries depart from Split, destined for neighboring islands. Marina grazing (left) and attracted by a carrot (right). Hrvoje shows us a prototype for a donkey saddle with solar panels that can be used by participants to charge electronics. 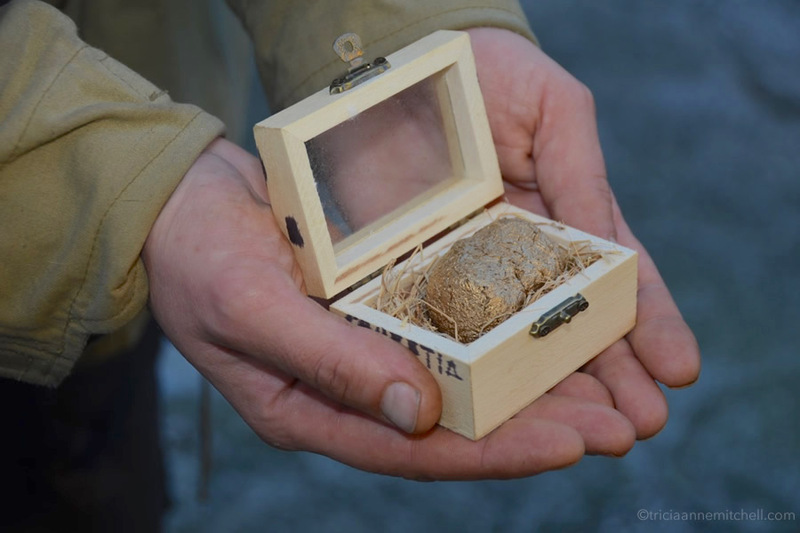 Hrvoje holds a wooden box containing gold-painted donkey poop. It’s a quirky fundraising effort for Toward Europe. For €50, donors can purchase a golden nugget and then use it as official currency for buying Toward Europe experiences. 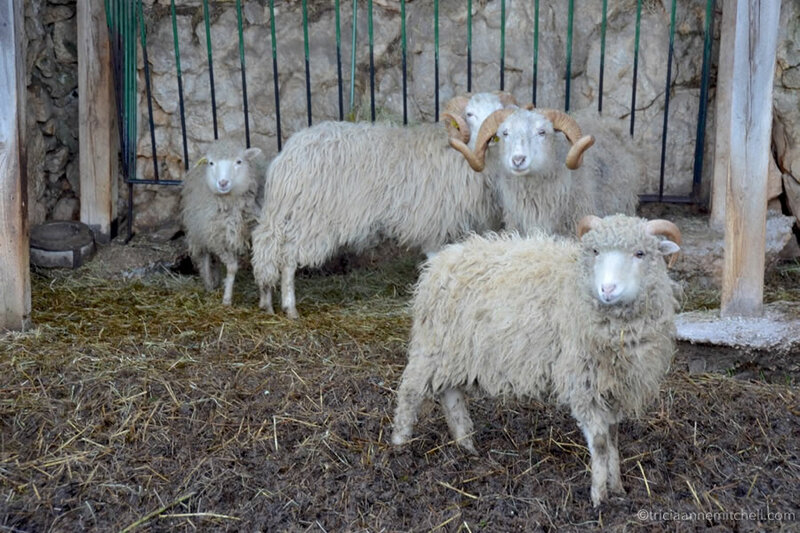 Fifteen sheep live in the confines of the former zoo. 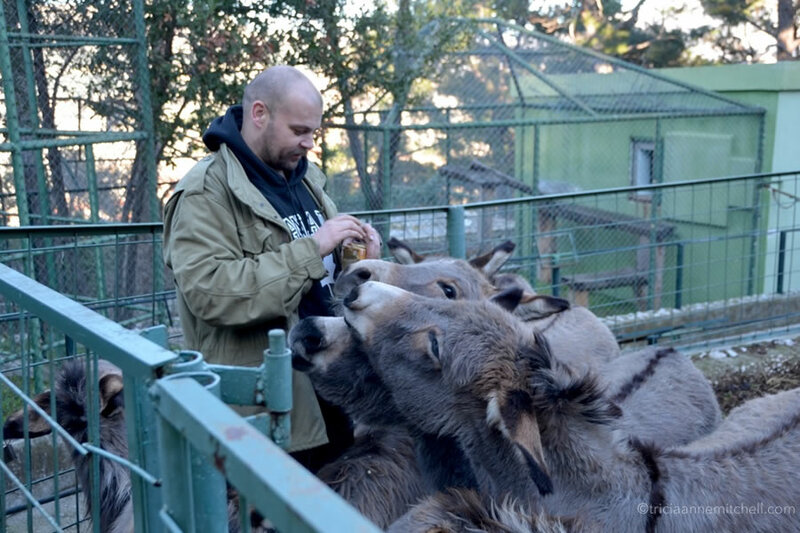 Hrvoje gives treats to the eight resident donkeys. In the left corner is an African goat. Hrvoje explained that when the goat’s mother died, many people thought this goat would die too. As an experiment, they let the goat co-habitate with the donkeys. Today, she’s the unlikely leader of the herd, Hrvoje explained. Hrvoje, as well as other good samaritans I met, feed the stray cats residing in Marjan Park. Marina faithfully waits for Hrvoje at the entrance to the former zoo. Visit the Toward Europe Facebook page to see more photographs of this project. Looking for more inspiration as you plan your trip to Croatia? See my Croatia guide and index. Such a great post! I love donkeys so much. Glad you enjoyed it, Bobbi. I also have a soft spot for these guys. We were just in Montenegro a few weeks ago, and kept bumping into a local who lived in a stone cottage halfway up a mountain. We’d run into him at the supermarket and he could never talk for too long, because his donkey was waiting in town to help him carry the groceries back home. :) Hope you’ve been having a wonderful spring! This is a lovely story. I hope they are successful in keeping the donkeys safe for the future. Carol, you can imagine my delight when I first bumped into Marina the donkey while I was out walking one evening. 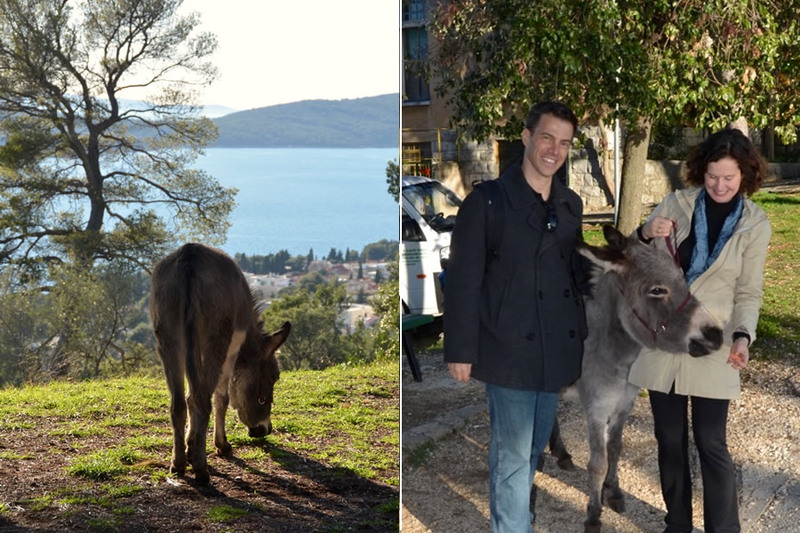 Split is one of Croatia’s largest cities, so it was fun to see a donkey not far from an urban area. In my husband’s hometown his parents would sometimes see a semi-feral donkey out in the desert. Do you know if there are many in Australia? I believe there are feral donkeys, but I’ve never seen one. There are also feral camels. Feral camels – wow, I never would’ve expected that! Here’s hoping they’ll find a humane and practical way to manage them, Carol. Greetings Virginia, always wonderful to hear from you! It’s true that interactions with people like Hrvoje and personalities like Marina make a place come alive. Somehow, I think Marina knows she’s a local celebrity, too. :) Here’s hoping you’re enjoying a wonderful spring? The donkeys are so adorable. It’s nice to see someone is taking care of them. Hope you two are doing OK.
Hi Darlene, nice to hear from you! We are well — just hopping between Croatia, Montenegro, and Bosnia-Herzegovina these past months. 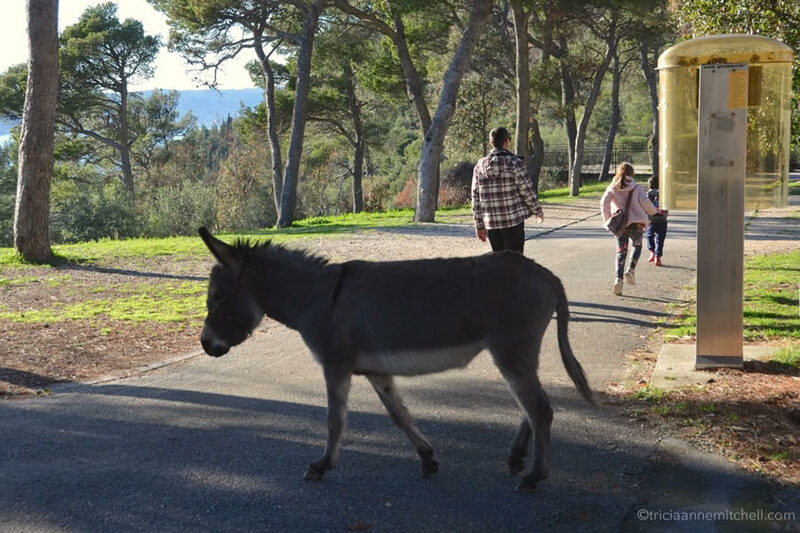 Do you see many donkeys in Spain? I imagine the donkey populations are dwindling there too? We don’t see many donkeys here at all actually. I must ask around about that. Thank you, Kelly. You’re correct that there are a good number of donkey lovers out there. I’ve connected with a few of them as a result of this post, and it’s been heartwarming to hear their stories. Some are donkey-owning expats, another reader was an animal welfare advocate who traveled to donkey sanctuaries around Europe and the Middle East. I see you’re passionate about solo travel — that’s great! Before my husband and I met, I went on a lot of solo adventures. I met a lot of kind people along the way. Sometimes they were worried about me traveling by myself and wanted to take me under their wing; at other times, they were just eager to share their culture with a far-away visitor. Both are beautiful cities; here’s hoping Dubrovnik won’t be so crowded in February. I was once there in April, another time in July, and the springtime visit was wonderful — especially in the evenings when all the daytime visitors had left. A happy weekend to you, Kelly!